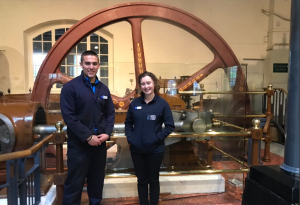 Throughout my time at the London Museum of Water & Steam, I have experienced quite a lot that I normally would not have had the chance to experience in a work place. At the London Museum of Water & Steam I have been supervised by the Learning Coordinator here, Gemma Eglinton, who has been a great person to shadow and learn from. While volunteering here, I have done many tasks from assisting and learning how to operate around large groups of primary school students to even spending the day with one of our many volunteers. My two favourite tasks that I have done while here was, first, my day spent with Chris Jones, a volunteer, who taught me all about the engines and the maintaining of them. I really enjoyed learning the mechanics behind these impressive monuments of engineering. My other favourite day was the time I had the opportunity to shadow Gemma throughout a school day and see just how her techniques work to keep the students organised, focused, and always willing to listen. The time I have spent at the London Museum of Water & Steam has been nothing but memorable. I plan to use the experiences that I have received here, along with my new life perspective to become a better employee along with being a more inclusive and accepting coworker. I cannot thank the London Museum of Water & Steam and the staff and volunteers here enough for accepting an unknown university student from a small town in Pennsylvania, USA to gain workplace experience, while learning more about the world, life, and myself. This place will always have a special meaning to me, as it was the first time I had the opportunity to open myself up to the world and become a better well-rounded individual.